With over a million downloads in less than 24 hours, Peter Jackson’s Sci-Fi thriller District 9 is well on it’s way to becoming the most pirated movie of 2009. The huge download spike is caused by a DVD quality version of the movie that leaked onto various BitTorrent sites yesterday. In the present day and age, no blockbuster movie can escape the fate of being pirated. However, the popularity of the various rips and titles can differ drastically, and a recent leak of a high quality version of Sci-Fi thriller District 9 might become a record breaker. Two weeks ago a Telesync version of District 9 already found its way onto the Internet, but the rate at which the freshly released R5 release is being downloaded easily beats all other titles released in 2009 to date. At the time of writing the movie has been downloaded over a million times on BitTorrent alone, less than 24 hours after it first surfaced. There are a few dozen torrents out there already, and the most popular one has over 50,000 people downloading the movie simultaneously. At the US box office District 9 has grossed a mediocre $100 million since its official release three weeks ago, which puts it in the 20th spot of all movies released this year. In comparison, the latest Transformers movie grossed a similar amount in its opening weekend. 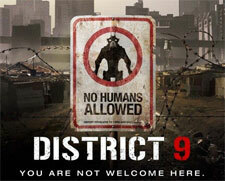 Whether the pirated versions of District 9 will slow down the sales of theater tickets remains to be seen. In the comment section of the torrents some people say they’re not going to download the movie before they’ve seen it on the big screen, while others who’ve already seen it in theater justify the download because they can’t wait for the DVD to come out. We’re pretty sure though that the execs at the movie studio won’t be as excited about the movie’s online availability as some of the downloaders are. This entry was posted on Monday, September 7th, 2009 at 10:24 pm. It is filed under Blog, Movies, News, Torrent. You can follow any responses to this entry through the RSS 2.0 feed.